All forests have their own smell, own sound, own swirling whispers and above all have their own personality per se. Ranthambore Forest is no exception. 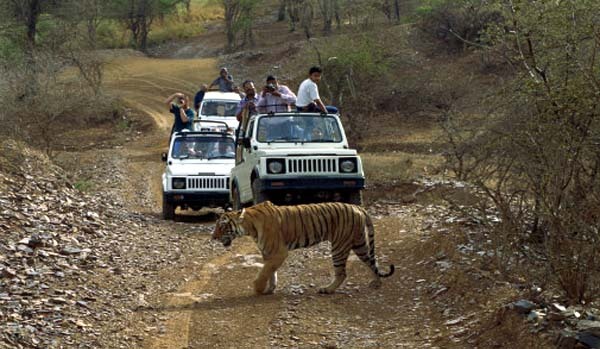 The National Park is located around 11 kms from Sawai Madhopur, a small town and around 130kms from Jaipur and is well connected from both Delhi and Mumbai. That it is one of the biggest national park in the Northern part of India known for its majestic tigers and other wild animals is widely accepted all over the world. 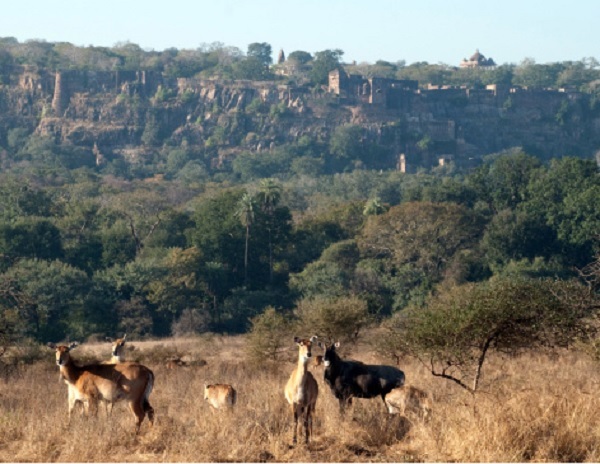 We all know that the park is named for the historic Ranthambore fortress, which lies within the national park. The park lies at the edge of Aravalli hills, and is bounded to the north by the Banas River and to the south by the Chambal River There is several lakes in the park which are spectacular. Our stay at the beautiful, sprawling Taj, Vivanta, Sawai Madhopur lodge was quite of the world. We reached there under murderously hot sun and yet returned after four days almost marinated in rain. This heritage lodge was actually the Hunting lodge of Maharaja of Jaipur and had an opulent history. The best part of our trip was obviously the Safari rides (three and half hour rides twice a day in the morning and in the evening) at the Ranthambore National park. We had four such Safari rides spanning over three days, in the forest in an open top six seated gypsey. The inner park area has been divided into several zones and the safari vehicles would go on one of those zones in one particular ride. We managed to visit zone 1, 3, 4 and 5 and luckily on the first ride itself, in zone 1, we had a glimpse of the Big Cat trotting before us on a sombre note during sunset. There was an absolute calm when the tiger almost nonchalant made its first appearance after the torrential rain (we were totally drenched) and the onlookers in a few gypsey/canters talked only in a whispering tone. A sense of awe has engulfed us before this awesome creation of nature through the sheer radiance. The Big cat was perhaps quite oblivious of his stunning beauty even though his stripes were slightly smeared with mud/dirt and walked away in a leisurely way under the canopy of leaves of the Banyan tree. We were later told that this tiger was actually T-24, incidentally the largest in this forest. The sight of this majestic predator was awe-inspiring. The total tiger count was 48 including cubs but we could see only the biggest one. We did once have a near miss of spotting the tiger basking under the sun with her cub near the lake in our subsequent rides. We narrowly missed the sight of leopard as well at the edge of a precipice in spite of vehement monkey calls (warning everyone in the vicinity) during our third ride. The fatal human (locals)-tiger interactions and poaching were a constant threat. A lot of measures have been taken by the authorities to reduce the threat in recent times. This 1300 sq.km forest is huge and it will take days to have a feel of the nature here. 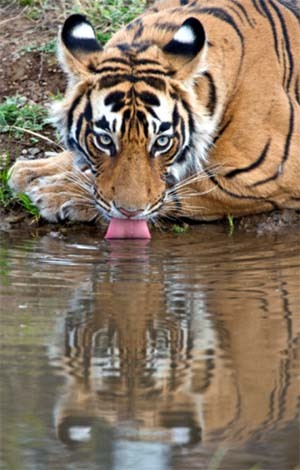 The beauty of Ranthambore forest does not begin and end with tigers. Besides tigers, the reserve has thriving bird population with more than 270 different species of birds here. Then there were 15000 spotted dears, 10000 sambar dears and countless peacocks and monkeys and a few leopards and sloth-bears as well as told by our guides on various rides. This deciduous forest has its own charm for its trees, in their highest boughs the world rustles, their roots rest in infinity; but they do not lose themselves there, they struggle with all the force of their lives for one thing only: to fulfill themselves. However, mix deciduous elements could be seen in the valleys and along water bodies. The Flora of the Park was represented by 539 species of flowering plants. There were a few Amaltas (yellow grapes) and the clusters of massive Banyan tree (quite common here) which had provided green cover for the forest. There were odd Nilgai, wild boars, crocodiles, tortoise; we could spot in the forest. As we entered more and more to the deeper part of the forest, the silence was palpable, occasionally filled by the shouts of monkeys and peacocks and tweets of the birds. We were fortunate to watch animals running for covers in blistering rain. Normally, the park remained closed in the monsoon (July-Sept) but we could witness the aura of the jungle soaked in pre-monsoon showers (a rarity here) and tiny rivulets overflowing in rain displacing small crocodiles from one end to other. During rain, the wind was whipping which threw dust and leaves into our face but still you would like to immerse in the rain. The dancing peacock during rain was a beautiful sight and they did not disappoint us and some of them did look highly professional to look after the visitors. Our trip to the 10th century built Ranthambore fort associated with Chauhan Dynasty was amazing. The fort had an opulent history and Akbar also captured the fort in course of time and finally the fort passed onto the Maharajas of Jaipur. The fortress nestled in the forest, had a strategic location and an imposing structure, an architectural wizardry, which covered an overall area of 102 hectares within a circumference wall of 5.4km, and had a buffer zone of 372 hectares. It was standing 700m above the surrounding plain. The view of the all-encompassing forest and the lakes (Padam Talao, Malik Talao and Rani Bagh) were mind boggling. The squared loopholes built for placing fire arms were truly intriguing. Here, we have noticed that the dense forest was also a line of defense for the people. In view of the steep ascent, stairs had to be cut into the rock and connected the four stately gates which would guard the access to the palace area. Following the zigzag ascent, the final gate leads into the palace area, beyond which are temples, shrines, chattris and other walled enclosures. We visited on an auspicious day when thousands of devotees were there to pay their homage to the Lord Ganesh. Inside the fort, four old (5-13th century) temples (Ganesh, Shiva, Ramlalaji and Jain) were located. There were thousands of people flocking the temple to pay their homage and we also were the lucky ones as someone told us on our return journey. We had noticed that the friendly food-loving monkeys were the signature animal in this forest with impeccable behaviour and the fortress was no exception with hundreds of them on duty of guarding the fort and the temples as well. It was quite tough to climb up the rocky stairs but the ending was sweet like laddoo which was distributed to the devotees. Ranthambore in all its glory will be etched in our memory forever.We promised at the end that if God permits, we had to come back here again and again as we knew that the forests were always among our best allies in the uncertain future ahead. Thanks Mohini for your kind words.